Wondering if pharmacy may be right for you? The American Association of Colleges of Pharmacy has compiled the top 10 reasons to become a pharmacist. Which one resonates with you the most? Pharmacists play a key role in helping patients feel better and get well as quickly as possible. Patients do best when pharmacists are part of their healthcare teams because pharmacists are the medication specialists. Pharmacists improve medication adherence. They are culturally competent healthcare providers who communicate effectively to evaluate many factors that affect a patient’s ability to take a medication. These include diet, lifestyle, transportation, language barriers and much more. Pharmacists are accessible in all healthcare settings: inpatient, ambulatory and community settings. When you become a pharmacist, you become available to see patients at convenient times every day of the week, during morning, evening and weekend hours, and without an appointment. They are licensed to provide immunizations in all 50 states. 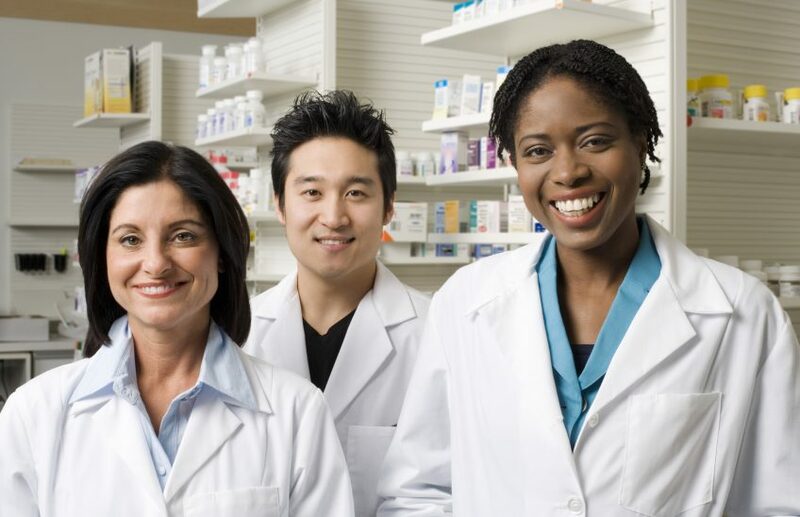 Many states also allow student pharmacists to provide pharmacy services under the supervision of a pharmacist. Pharmacists may also provide other services such as asthma care, blood pressure monitoring services, cholesterol screening, diabetes disease management, smoking cessation consultation, bone density scans for osteoporosis screening, anticoagulation management clinics and more. Pharmacy is a diverse and rewarding career, with opportunities for patient care, scientific research and innovation. Pharmacists can work in a myriad of professional settings. The majority of pharmacists (45 percent) work in an independent or retail chain community pharmacy and provide counseling to patients on the use of prescription and over-the-counter (OTC) medications. Pharmacists work in numerous other healthcare environments as well, including hospitals, nursing homes, managed care organizations, the pharmaceutical industry, colleges and schools and the federal government. Pharmacists play key leadership roles in all aspects of the healthcare system. Increased demand for patient services. The transition to the doctor of pharmacy (Pharm.D.) degree for all new pharmacy graduates has increased the type of services pharmacists are able to offer. Pharmacists are able to work in a wider array of practice settings and positions than ever before. Increase in number of prescriptions filled each year. According to the National Association of Chain Drug Stores, the number of prescriptions filled increased from 1.9 million in 1992 to 3.9 billion prescriptions in 2013, and in 2015, 4.1 billion prescriptions were filled (projected to be 4.7 billion in 2021). Our society will continue to need more pharmacists to manage the growing number of prescriptions as more medicines become available and the population ages. Increase in the number of medicines available on the market. There is a greater selection of prescription and OTC drugs manufactured today than in the past. Multiple medications are often available to treat a single disease. Pharmacists help prescribers and patients decide which medicine will have the most beneficial results. When pharmacists are involved in patient care, outcomes improve and costs decline. Increase in the elderly population. According to the U.S. Census Bureau, 1 in 5 Americans will be classified as elderly by 2050. Older patients generally have more chronic illness and more complicated drug regimens than younger individuals. Pharmacists play a key role in helping the elderly patients navigate complicated medication requirements and explore ways to minimize their financial burden. The aging population has also increased the need for long-term care, geriatric and consultant pharmacists. Pharmacists work with other health care professionals to maximize health outcomes. Numerous studies have proven that the presence of a pharmacist on hospital rounds as a full member of the patient care team has been shown to prevent medication errors and reduce costs. Pharmacists provide optimal management of medication for chronic diseases such as diabetes, asthma, hypertension, etc. The collaboration of healthcare professionals, such as physicians and pharmacists, can help to ensure that patients properly take their medications as prescribed and avoid any harmful effects. Pharmacists are employed in every part of the country. Pharmacy licensure is generally reciprocal between U.S. states, however, additional tests or criteria may be required to transfer licensure status. Pharmacists may be able to establish non-traditional or part-time work hours, depending on the practice setting. Most Americans live within five miles of a pharmacy, so pharmacists are needed all throughout the U.S.
One of the many exciting developments in the pharmacy profession is the growth of a discipline, known as pharmacogenomics. Genetic variations in genes can affect a body’s response to a drug. In the future, specialists in this area hope to sequence the entire human gene in each individual. Pharmacists and other healthcare providers will be able to use that information to select the best medicines, treat diseases earlier than now possible, or prevent them entirely with individually-tailored drug therapies. Digital innovations in pharmacy include electronic prescriptions, robotics for central prescription processing and nationwide prescription monitoring programs, as well as pharmaceutical research. These technological advances enhance efficiency and help to promote patient safety. Pharmacists use these same tools to help prioritize work, manage the dispensing process and spend more time with patients. By law, pharmacists must oversee automated dispensing processes for quality control purposes. Pharmacists can provide innovative approaches to medication management, including recommended therapies, and the identification and resolution of problems with the aid of state-of-the-art technology. Pharmacists are educated to recognize signs and symptoms of diseases that may be used in a biological attack. The accessibility of pharmacies could be one of the keys to a successful mass immunization or drug distribution program in an emergency. In an epidemic or bioterror situation, pharmacists are prepared to play a major role in preventing the spread of disease and overseeing the distribution of appropriate and safe medications. According to the CDC, pharmacists are equipped with the necessary skills to improve our nation’s health and are vital members of the team in public health initiatives. According to recent Gallup Polls, pharmacists’ honesty and ethics were rated as “high” or “very high” by a large majority of Americans. Pharmacists are visible leaders in our community who are entrusted with the health of our families. Want to become a pharmacist? Subscribe to our newsletter for monthly insights.